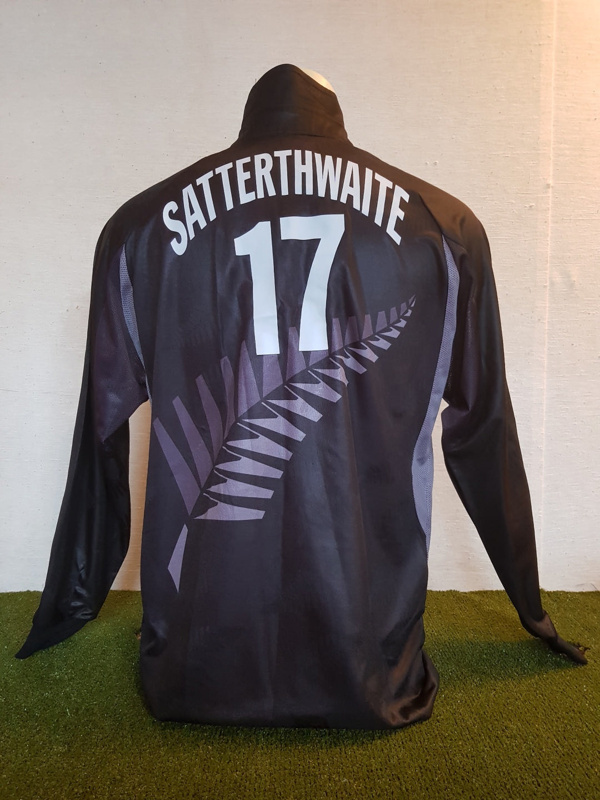 About this objectAmy Satterthwaite's match-worn WHITE FERNS' limited overs shirt from the 2007 tours to Australia (Rose Bowl) and England. Satterthwaite made her New Zealand debut on these tours, playing her first T20I against Australia on July 19 2007 and her ODI debut against the same opponents came two days later. In just her third T20I, played on August 16 2007 against England at Taunton, Satterthwaite took 6 wickets for 17 runs. These figures remained the best in a women's T20I until 2018 when Botswana's Botsogo Mpedi took 6 for 8 against Lesotho. It was also the first time Satterthwaite had bowled in a T20I. Medium and Materials100% polyester, text and logos are a mixture of sublimation, screen printing, and embroidery. Inscription and Marks"AMY.S." is written in black pen on the neck tag.